This is the second in a series of articles documenting my experience with the introduction of 3D CAD into industrial/mechanical engineering. Please take some time to read them all. From board draftsman, to 3D CAD designer, to 3D CAD program dealer, to 3D CAD teacher, some of this information may surprise you. My First 17 Years or "How did we do it without 3D CAD! "The 1990's - 3D CAD/CAM Moves to the PC!! It was November 1982. Back to Willy’s Rocket Shop in Walled Lake, MI. I have to be a glutton for punishment, you would think I would be smart enough “not” to take another winter contract in the tundra of Michigan. But the money was good and I knew everyone there. When I arrived something had changed!! I showed up for the first day and my good friend Bill (who actually requested me) had a new job. What the heck is CADDS 4, I asked. I was aware of 3D CAD from my time at Martin Marietta in 1980. I saw an engineer working at a CAD terminal doing 3D design. It may have been a Computervision CADDS 3 system. It was also green graphics on a black background. Notice the digitizer pad, used with a stylus for fast input. We could also (like Autocad) type our commands. Bill walked me through the CAD room. There were around 10 CAD stations. It was very dark and each terminals had a small adjustable dimming lights. The terminal were against the walls on each side of the room. He then took me to the Computer Room. I know, I know, CAD is on PC’s!!!! Not in those days. There it sat, this very large computer in the middle of a refrigerated room. There was also a large format stainless steel Versetec Printer. Remember that the paper print was the engineering deliverable until the turn of the century when the PDF showed up. Then we went to his office which would could only be called the data storage center. There was another terminal that was obviously a systems terminal without the graphic monitor. 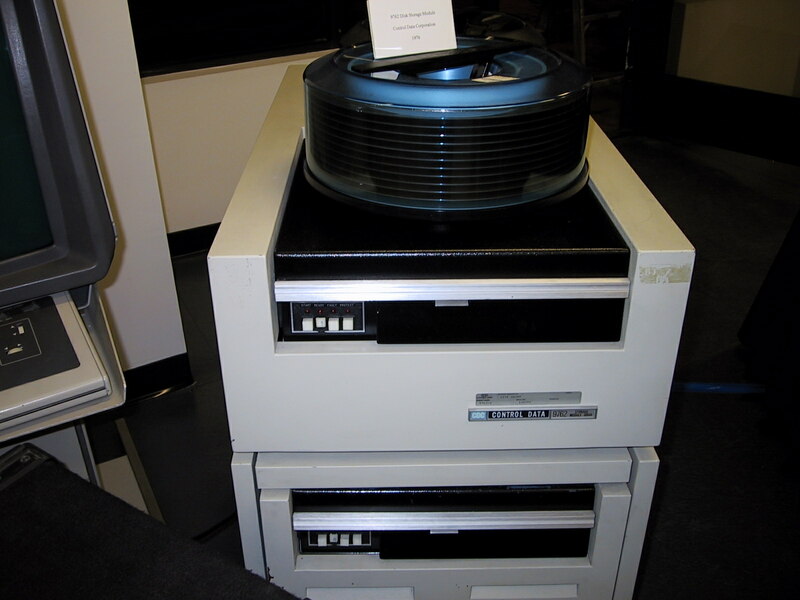 There also was a huge hard drive that housed these removable disks. There was also a reel tape system and a wall full of tapes. These systems were very expensive. $250,000 per seat!!! What? Not only that but you had to buy a minimum of 3 seats, for a whopping $750,000. Remember this was in 1982. He went into the CAD room and proceed to give me a demonstration. 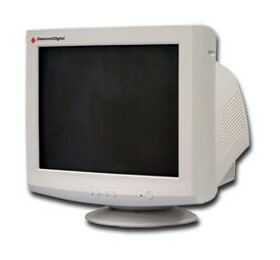 These were monochrome monitors with a keyboard and a large digitizing tablet. This is what a part basically looked like except the back ground and graphics were much grainier. But these were not Solid!! Or Surfaces!! This was a wire frame system. All of the entities, lines, arcs and splines, created individually, were used in a 3D space to create a 3D shape. Look at the lower image, are you look up or down at the part? Yes, that was a constant problem. Especially when working with the poor engineers. It was really in 3D!! I was amazed. I was hired to work on the board. I would take my break time and sit with the CAD designers. Most were old friends and all were draftsman. Engineers didn’t do drawings so they were not interested in CAD. I saw the writing on the wall (this is a phrase I will use again in the future) and talked them into letting me train on evenings and weekends. All You Wanted to know about CAD Training?? 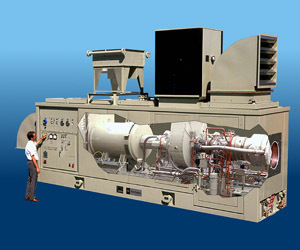 It was an odd system compared to the easy to use PC based 3D CAD systems of today. We could input the commands by keyboard or a digitize tablet that had graphic commands around the center digitizing area and you selected your commands with a stylus or what we called the “dig pen” (The dig sounded like “dig”itizing) These were made up of approximately 1” squares with graphics that represented the command. The first thing you did when you came on board was to design your own unique tablet template. The problem being, no one could use your system. So the experts (including me) learned to type our commands. I quickly learned the system and became an expert operator. This was not a pleasant design experience as compared to today. In 3D it could be a mess trying figure out where you were. Remember these were wireframes and sometime you didn’t know which way you were looking that the part. Even though it was a 3D space you could lock it on to a 2D plane and do other documentation. The selling point of the system was that we could design in 3D and create the drawings in a “drawing module”. You could place the views and detail them. But this was not the beautiful hidden line removed views produced by today’s CAD systems. We had to blank, trim and define the line type. I was a lot of work (no wonder the engineers were not on board). But once cleaned up the drawings were much easier to create. You just put in the dimensions and annotation and inserted a border and they looked just like a drawing. But these were not drawings. I think that was a mistake, calling them drawings. I had done thousands of drawings and these were not even close to creating a scratch drawing. I am sure if they knew the trouble that was caused by this they would have named them something else. At Boeing they started calling them flatfile to differentiate them from the 3D model. I coined them the AID (Associated Information Document). Here is a video giving a bit more flavor of the age. I was done in 1988 when CV had incorporated more advanced surfacing. Notice him typing in the commands. That was how you recognized a trainer, support personnel or an expert. "WBZ TV, Boston, once aired a series showing teens about possible career choices. ComputerVision, then the leading CAD/CAM company was featured in a short segment. What was shown was a Product Marketing Specialist demonstrating the features, functions and benefits of the CV CADDS system (CADDS 4X on color monitors) to "customers", actually employees of the Advanced Technology). This was filmed about 1988 or 1989 and was a two day affair for this short segment." The video takes a second to start. As soon as I felt comfortable I updated my resume with my new CADDS 4 experience. I was instantly contacted with a job at a much higher rate. I think it was around $30.00 per hour. 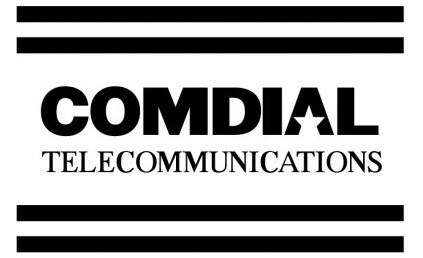 It was a job at Comdial in Charlottesville, VA. The only problem: It was a third shift. From 10pm to 8am. Who had heard of such a thing? Engineers working different shifts? But at $250,000 per terminal, who could blame them. They were designing new phones. I had no idea how to design for plastic parts. But basically just followed the previous products and did fine. I had jump disciplines, this was unheard of in engineering. They designed the molds and molded the parts on site. I would work with the mold designers and watch the parts being made. Creating parts in 3D with draft was a horror show. They were still using AIDs (drawings) so it wasn't much of a priority. You would just add the draft in the dimension or as a note in the AID (drawing). This is a story a bit out of the time line but it is relevant to this subject. Years later I was working with Spacelabs, in Redmond, WA. It must have been in the early 1990's pre-solid modeling. They had designed a part in PC Based 3D CADKEY wireframe without any draft. They hired me to add the draft and surface the model for stereolithograpy (forerunner of 3D printing). I told them it would take 55 hours. They said "it didn't take that long to design the part". I told them "then you should have designed it with draft". They came to me again with another very similar part (You would have thought they would have learned their lesson). But Fastsolids for CADKEY had just been released. It took 15 hours!!! It was funny, people were sending me checks to get the Fastsolid Beta after one seminar presentation. We will get into that in the next article. Charlottesville was a great place. But the 3rd shift did not work for me. I was living with a perpetual headaches, out went my resume but now with plastic product design. I got a job with Solar Turbines. It, like Williams, had a dark room full of terminals. Again all of the CAD operators were draftsman. It was a good job with good pay and it was in sunny San Diego. I had my family there and it was wonderful. We were now working with CADDS 4X. Computervision finally came out with a Colored Monitor, a $25,000 option. They got one. We would take turns getting to use it. There was a constant fight for this terminal. 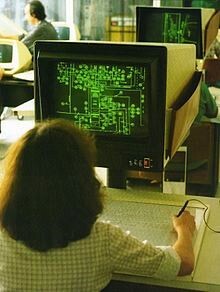 Remember this was on a network that was hooked directly to the computer and we could work on any of the terminals. Soon we all had colored monitors. CAD design got twice as easy and productive. The world was perfect. Good money, lots of overtime. Then something happened. Management decided to move the engineers to CAD and they could eliminate the draftsman. I always thought it was Pro/engineer that lead this move, but I finally realized this happened in 1985. No Pro/e at that time! So all of the contractors were let go except for me. All of the direct draftsman were given a golden handshake. This was shaking up my world. They told the engineers that they would be moving to CADDS 4X. They resisted knowing that they would be doing a massive amount of grunt drafting work. But management said “Get on CAD or get fired”. My job was to get them all up to speed. Most learned quickly and became good CAD designers. Remember this was wire frame design. This was much easier than solid modeling but very time consuming and tedious. Sadly, there were only two new draftsman that did not qualify for the golden handshake. The one they put in charge was one of those fellows that everyone picked on. I, unfortunately, was the lead protagonist in picking on him. Gulp, out went the resumes. I was contacted by an old associate that I worked with at Solar. He informed me he went back two times 1986 and 1990 as a contract drafter. So I guess the move to engineers didn't go as smoothly as I thought. Back to Williams for the third time. 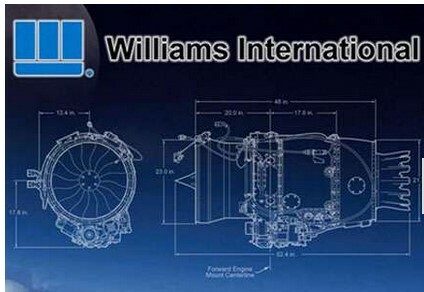 Williams had expanded their CAD use and were now quite experienced with the process. We all had colored monitors now. It was much more sophisticated. The engineers were still working with the draftsman on the system. Still not involve with CAD. 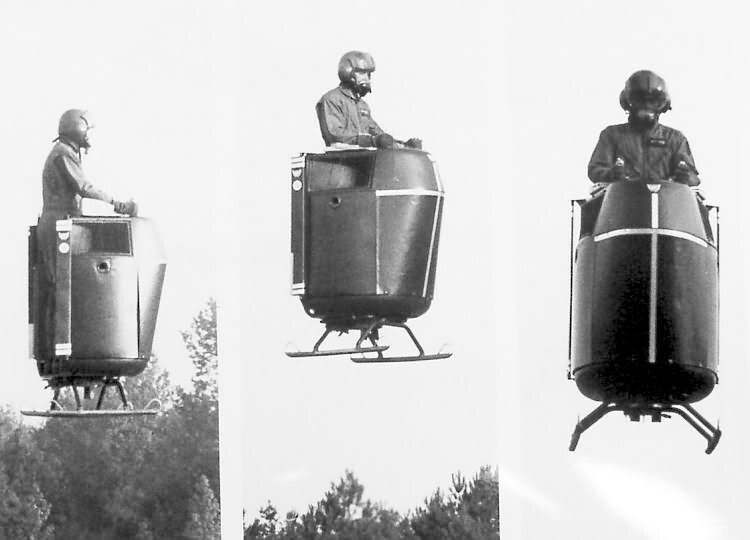 The Williams X-Jet, created by Williams International, was a small, one-man, light-weight, Vertical Take Off and Landing (VTOL) aircraft powered by a modified Williams F107turbofanaircraft engine. We had just bought a house on Bainbridge Island, WA. I moved my family and I stayed on with Williams. We had just had my son and I was getting lonely. I took a job at Goodrich in Akron, OH. But a miracle occurred. I got a contract at Boeing Everett. Home I went. The World of Engineering was about to change! Enter the PC (Personal Computer) Based 3D CAD System! 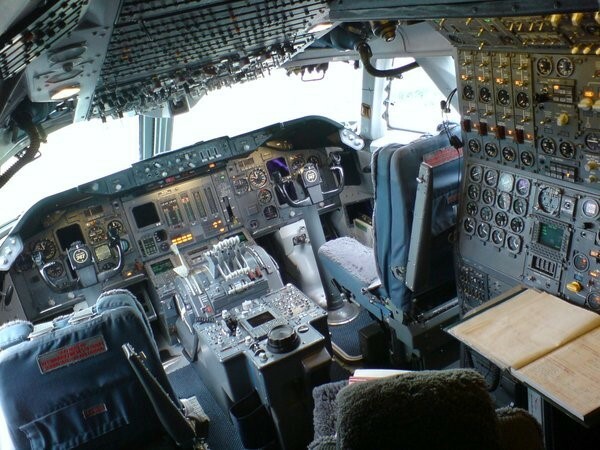 It was a manual drafting job, in the 747 Flight Deck group. It now had been 3 years since I had been on the board. I still had all of my tools and had no problem getting back into manual drafting. They had 3 stations of Catia 3 and there were some CADDS 3. I went back to see the CADDS 3 and it was quite different. I just remember some kind of control handles. No contractors got on Catia so I was lost. I was moaning and groaning, I was the new highly skilled “3D CAD Designer”. Someone told me that there was a PC (Personal Computer) based 3D CAD system on a couple of Compaqs. I was already into the IBM PCs. I picked up an IBM luggable while in San Diego. I got a copy of Autocad and did a fence for my back yard. My luggable had an a 6" amber screen. 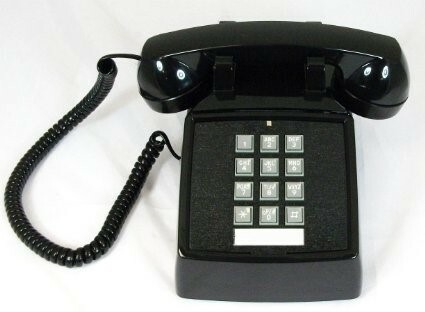 It must have been around the same time as my Boeng contract, because I remember playing with it in my home office. But I was a 3D CAD operator. Autocad was an architectural electronic drawing package. It was incredibly painful and was "not" conducive to mechanical design. I am not sure when 2D as a designation came to be. Autocad had no copy protection and no one wanted to pay for CAD in the beginning. Autocad actually stunted the growth of PC based 3D CAD. Many in the Industrial/Mechanical industry moved to Autocad and continued creating scratch drawings. I took another 15 years before Autodesk produced a viable 3D CAD system. "The popularity of Autocad was due to its lack of copy protection, basically allowing it to be passed around freely. It actually stunted the growth of PC based 3D CAD for the industrial/mechanical engineering industry for decades." What I am saying here I was already familiar with a PC based graphics program. I sat down to one of the Compaqs and proceeded to review the program. It was a system called CADKEY. I found it quite similar to CADDS 4X. Like CADDS 4X it was wire frame. Luckily we had colored monitors. I was not driven by a tablet or did it even have text input, it was driven by a “Mouse”. It had a very well laid out GUI (Graphics User Interface) and very easy to learn and use. It was much, much more productive than CADDS 4X. After two weeks of lunch hours I did a presentation to the management and they approved a test project. It was the 747 First Observer’s Station. We were getting loft lines from Catia 3 via IGES. I worked with an engineer and we did the job. I created the drawings and released them as prints. I realize as I looked for an image this station was to replace the flight engineer station was now not required. There were a few differences. CADDS 4X had primitive surfacing that aided your wireframe design and it had a separate documentation module. A drawing in CADKEY were copied views of the model and placed like any views on a drawing in the same 3D space on a different level. It had 256 levels. You would then create a border around the views. Then you would print to a scale. Yes, it was quite a bit of a hassle. Management was impressed and proceeded to order more CADKEY and PCs. I was in charge of implementing the systems. I trained the users which was very easy since all were draftsmen and engineers. Soon we grew to 25 seats and every design engineer and draftsman had a PC and CADKEY. It was funny we were promoting all of the draftsman and engineers to play games like solitaire to get familiar with the PCs. These new PC's threatened the BCS (Boeing Computer Services). They were like the gastapo. Demanding that we did no programming. They even tried to remove the CADL (CADKEY Advanced Design Language) an integrated light programming language. BCS had a vendetta out for CADKEY. They focused on Catia to keep their power. Boeing would have been miles ahead if they would have adopted CADKEY as their default CAD system. I will get into Dassault's influence in Boeing engineering process in the next decade. After I left they grew to 35 seats and got rid of one of the Catia 3 seats. The 3D CAD World had Changed! We were now in the world of PC based 3D CAD. I saw the writing on the wall and quickly became a CADKEY dealer. I bought a seat of CADKEY $3500, a new 286 Compaq $3000, a huge 19” monitor $2500 and got ready to present CADKEY to the world. $9,000 compared to $250,000 and I am sure Catia was well over $100,000 how could I lose?? 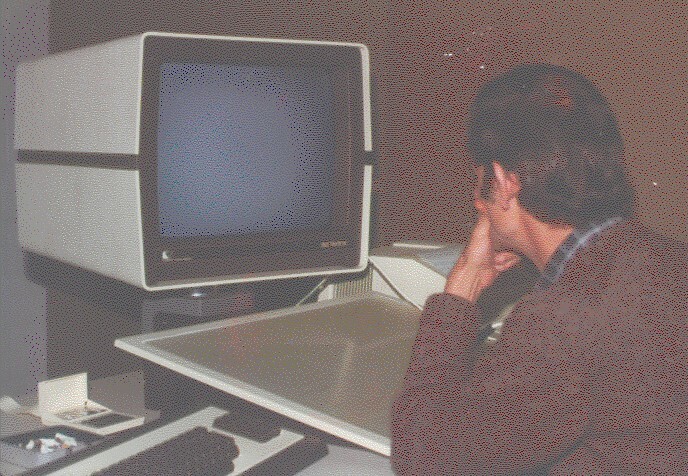 The monitor above was a state of the art 19" monitor we used for then next 2 decades, around $2,500.00 a pop. I took a much lower rate to get home, I asked for a raise and they offered me a dollar. I laughed and again out went my resume. They put me on the second shift after promising me I would be on a regular shift. I was ready to walk and they assured me they would start a rotating schedule. I was the only contractor. That never bothered me. I just got along with the employees and management and cashed my check. You had to be able to get along as a shopper. This was my second adventure into plastic design. 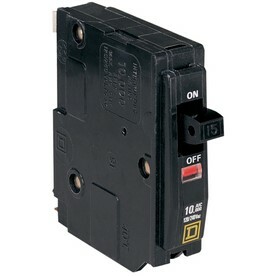 I was designing a new circuit breaker. I am sorry I couldn't get an image of the one I worked on it was a bit more stylish. We spent most of our time making sure it would have the correct “click-click” that was more important than the function. Similar to the sound of the Harley Davidson engine. Does anyone know why it sounds that way?? This was the first time I was introduced to CNC. They were using the 3D graphics to do 2.5 axis. We would work next to each other. I am not sure what they used for programming. But they would give us instant feedback which sometimes was not pleasant. They had not upgrade the CADDS 4X systems to Color monitors. I was horrible. I came in with my CADKEY station and showed them the advantages of CADKEY. They were very impressed and ordered three seats. I am sure that the color monitor was what closed the sale. For a little over the cost of one CV color monitor they had 3 seats of PC based 3D CADKEY. That was my first sale. It was for over $35,000. I took a few of the draftsman and moved them to CADKEY and we would convert files via IGES bringing the files over from CADDS 4X. That was where I formed my company and called it Technical Networking Inc. or TECH-Net, Inc. It had nothing to do with computer networking but people networking. I thought we would all be telecommuting in a couple of years. I got a call from my good friend Bill (remember the fellow from Williams) now CAD manager for CADDS 4X at Ford Aerospace and off to California. 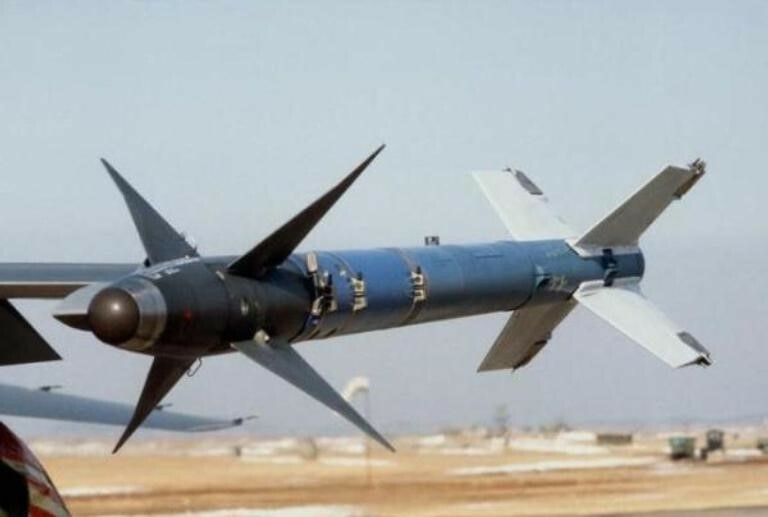 It was a good job, it was on CADDS 4X working on missiles. The Ford campus over looked the Pacific Ocean. It was paradise. I moved the family down for the summer and had a great time. But something quite fantastic was happening. I was still working for Square D. I would do a design on CADKEY and send it by phone modem. I suppose I was one of the first PC based CAD Telecommuters. I would put in 40+ hours at Ford then another 20 hours in my apartment at my full $35.00 rate for Square D. It was incredible. That was my last job. I moved back home open the TECH-NET, Inc office and proceeded to sell CADKEY in the NW. It was an easy sale to the Boeing suppliers. The only other PC base CAD package was Autocad and it was only an electronic drawing package. Virtually no way to communicate with Catia 3. Even though Catia 3 was running on a Unix box with its high cost and the complex support to operate, it was far beyond the reach of even the largest vendor. I coordinated with Boeing and we were soon getting the 3D IGES file and a print of the drawing. We had the Boeing supplier market. 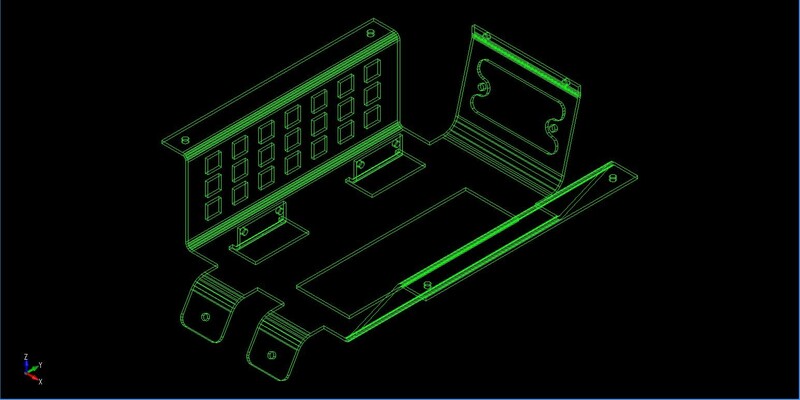 I was also active in supplying inexpensive 3D CAD to many other smaller NW manufacturing companies. I doubt if Boeing even understood the role I played in creating high level of compatibility with the suppliers saving them millions. I actually just realized it myself. The NW, led by Boeing, was now 3D. PC based 3D CAD actually moved smoothly into the 1990's at least in the NW with only CADKEY leading the way. But there was dark cloud being formed that would completely redefine the industry. Be careful with that light at the end of the tunnel.